To celebrate Vista’s 15th anniversary, we’re spotlighting a staff member who started with Vista across each of the 15 years. The stars aligned the day Christine noticed a “Classroom Aide” advertisement in the newspaper for The Vista School back in 2007. Christine had just recently begun interacting with two special needs children through her participation in her local church group and felt a pull to inquire about the ad for this specialized autism school. 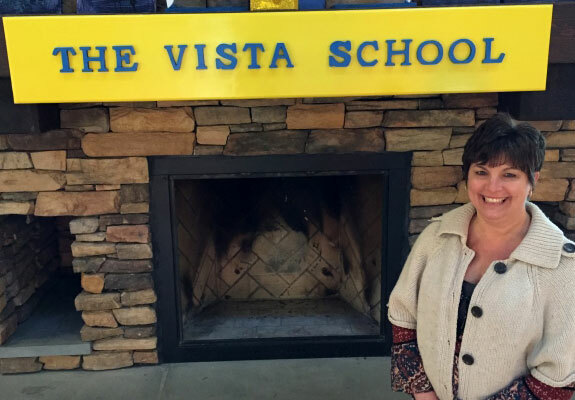 Having been fortunate enough to watch her own children grow, she knew in her heart she could do something to positively affect the development of Vista students through her ability to prepare meaningful materials that complement their unique learning styles. Though no day is typical, Christine has created pictures and icons for a multitude of requested items, including speech sounds, preferred characters, life skills symbols, and custom resources for the past 10 years. Now an Instructional Materials Aide, Christine has become not only a valuable team member to her colleagues and students, but also a trusted and cherished confidant. Though she doesn’t always get to directly interact with every individual at the school, adult services, and outreach, she still feels like she knows them personally from developing their preferred items. When she does get an opportunity to personally connect, however, she lights up with jubilation.